ROBERTSON COUNTY TENNESSEE: (Smokey Barn News) – According to the Robertson County Sheriff’s Office, investigators have identified two suspects that they allege are responsible for recent burglaries in the Adams and Coopertown area in January and Feburary of 2013. After an investigation, two individuals were identified as suspects of these crimes. Detectives allege that Charles Adam Arms (age 35) and Jonathan Bugg (age 24), both from Adams, TN, were responsible for the string of burglaries. The cases will be presented to the Robertson County Grand Jury in April. Both suspects are now incarcerated. Arms was arrested on February 20, 2014 on a parole violation. He is currently being held in the Robertson County Jail with no bond. Bugg is currently being held in the Logan County Jail in Russellville, KY on unrelated charges. 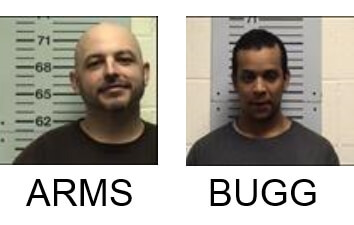 Bugg and Arms are also suspects in burglaries committed in Cheatham County and Kentucky. The Robertson County Sheriff’s Office has worked closely with the Coopertown Police Department, the Cheatham County Sheriff’s Office, and the Kentucky State Police to solve these burglaries and recover stolen property. Anyone who sees or needs to report suspicious activity may do so by calling Central Dispatch at (615) 384-4911. Ma is granddad is theif? Yes and he’s proud of it, see that grin. He, dumb and the dumber go down in history as the dumbest theif ever, becaue they ended up with three things; they got caught, they got time in jail, and they kept their dumb and dumber trademark; their smile. Caught steal they use to cut your finger or hand off. Wow, I wish we were back during those time, It sound like those were the good old days. The Arms of Bugs are never good. It doesn’t ride dirty it’s crawling dirty, dirty.